The Saint Lawrence River begins at the outflow of Lake Ontario and flows adjacent to Gananoque, Brockville, Morristown, Ogdensburg, Massena, Cornwall, Montreal, Trois-Rivières, and Quebec City before draining into the Gulf of Saint Lawrence, the largest estuary in the world. The estuary begins at the eastern tip of Île d'Orléans, just downstream from Quebec City. The river becomes tidal around Quebec City. The Saint Lawrence River runs 3,058 kilometres (1,900 mi) from the farthest headwater to the mouth and 1,197 km (743.8 mi) from the outflow of Lake Ontario. These numbers include the estuary; without the estuary the length from Lake Ontario is ca. 500 km (ca. 300 mi). The farthest headwater is the North River in the Mesabi Range at Hibbing, Minnesota. Its drainage area, which includes the Great Lakes, the world's largest system of freshwater lakes, is 1,344,200 square kilometres (518,998.5 sq mi), of which 839,200 km2 (324,016.9 sq mi) is in Canada and 505,000 km2 (194,981.6 sq mi) is in the United States. The basin covers parts of Ontario and Quebec in Canada, parts of Illinois, Indiana, Minnesota, New York, Ohio, Pennsylvania, Vermont, and Wisconsin, and nearly the entirety of the state of Michigan in the United States. The average discharge below the Saguenay River is 16,800 cubic metres per second (590,000 cu ft/s). At Quebec City, it is 12,101 m3/s (427,300 cu ft/s). The average discharge at the river's source, the outflow of Lake Ontario, is 7,410 m3/s (262,000 cu ft/s). The Saint Lawrence River includes Lake Saint-Louis south of Montreal, Lake Saint Francis at Salaberry-de-Valleyfield and Lac Saint-Pierre east of Montreal. It encompasses four archipelagoes: the Thousand Islands chain near Alexandria Bay, New York and Kingston, Ontario; the Hochelaga Archipelago, including the Island of Montreal and Île Jésus (Laval); the Lake St. Pierre Archipelago (classified biosphere world reserve by the UNESCO in 2000) and the smaller Mingan Archipelago. Other islands include Île d'Orléans near Quebec City and Anticosti Island north of the Gaspé. It is the second longest river in Canada. Lake Champlain and the Ottawa, Richelieu, Saint-Maurice, Saint-François and Saguenay rivers drain into the Saint Lawrence. The Saint Lawrence River is in a seismically active zone where fault reactivation is believed to occur along late Proterozoic to early Paleozoic normal faults related to the opening of the Iapetus Ocean. The faults in the area are rift-related and comprise the Saint Lawrence rift system. According to the United States Geological Survey, the Saint Lawrence Valley is a physiographic province of the larger Appalachian division, containing the Champlain and Northern physiographic section. However, in Canada, where most of the valley is, it is instead considered part of a distinct Saint Lawrence Lowlands physiographic division, and not part of the Appalachian division at all. The Norse explored the Gulf of Saint Lawrence in the 11th century and were followed by fifteenth and early sixteenth century European mariners, such as John Cabot, and the brothers Gaspar and Miguel Corte-Real. The first European explorer known to have sailed up the Saint Lawrence River itself was Jacques Cartier. At that time, the land along the river was inhabited by the St. Lawrence Iroquoians; at the time of Cartier's second voyage in 1535. Because Cartier arrived in the estuary on Saint Lawrence's feast day, he named it the Gulf of Saint Lawrence. The Saint Lawrence River is partly within the U.S. and as such is that country's sixth oldest surviving European place-name. The earliest regular Europeans in the area were the Basques, who came to the St Lawrence Gulf and River in pursuit of whales from the early 16th century. The Basque whalers and fishermen traded with indigenous Americans and set up settlements, leaving vestiges all over the coast of eastern Canada and deep into the Saint Lawrence River. Basque commercial and fishing activity reached its peak before the Armada Invencible's disaster (1588), when the Spanish Basque whaling fleet was confiscated by King Philip II of Spain and largely destroyed. Initially, the whaling galleons from Labourd were not affected by the Spanish defeat. Until the early 17th century, the French used the name Rivière du Canada to designate the Saint Lawrence upstream to Montreal and the Ottawa River after Montreal. The Saint Lawrence River served as the main route for European exploration of the North American interior, first pioneered by French explorer Samuel de Champlain. Control of the river was crucial to British strategy to capture New France in the Seven Years' War. Having captured Louisbourg in 1758, the British sailed up to Quebec the following year thanks to charts drawn up by James Cook. British troops were ferried via the Saint Lawrence to attack the city from the west, which they successfully did at the Battle of the Plains of Abraham. The river was used again by the British to defeat the French siege of Quebec under the Chevalier de Lévis in 1760. In 1809, the first steamboat to ply its trade on the St. Lawrence was built and operated by John Molson and associates, a scant two years after Fulton's steam-powered navigation of the Hudson River. The Accommodation with ten passengers made her maiden voyage from Montreal to Quebec City in 66 hours, for 30 of which she was at anchor. She had a keel of 75 feet, and length overall of 85 feet. The cost of a ticket as eight dollars upstream, and nine dollars down. She had berths that year for twenty passengers. Because of the virtually impassable Lachine Rapids, the Saint Lawrence was once continuously navigable only as far as Montreal. Opened in 1825, the Lachine Canal was the first to allow ships to pass the rapids. An extensive system of canals and locks, known as the Saint Lawrence Seaway, was officially opened on 26 June 1959 by Elizabeth II (representing Canada) and President Dwight D. Eisenhower (representing the United States). The Seaway now permits ocean-going vessels to pass all the way to Lake Superior. During the Second World War, the Battle of the St. Lawrence involved submarine and anti-submarine actions throughout the lower Saint Lawrence River and the entire Gulf of Saint Lawrence, Strait of Belle Isle and Cabot Strait from May to October 1942, September 1943, and again in October and November 1944. During this time, German U-boats sank several merchant marine ships and three Canadian warships. In the late 1970s, the river was the subject of a successful ecological campaign (called "Save the River"), originally responding to planned development by the United States Army Corps of Engineers. The campaign was organized, among others, by Abbie Hoffman. The Saint Lawrence River also passes through Lake Saint-Louis and Lake Saint-Pierre in Quebec. Where the Saint Lawrence River narrows, between Quebec City (left foreground) and Lévis (seen at right). The Île d'Orléans appears in the central distance. The Saint Lawrence River is at the heart of many Quebec novels (Anne Hébert's Kamouraska, Réjean Ducharme's L'avalée des avalés), poems (in works of Pierre Morency, Bernard Pozier), and songs (Leonard Cohen's "Suzanne", Michel Rivard's "L'oubli", Joe Dassin's "Dans les yeux d'Émilie"), and André Gagnon's "Le Saint-Laurent"). The river was the setting for the Canadian television drama series Seaway. The river has also been portrayed in paintings, notably by the Group of Seven. In addition, the river is the namesake of Saint-Laurent Herald at the Canadian Heraldic Authority. In 1980 Jacques Cousteau traveled to Canada to make two films on the Saint Lawrence River and the Great Lakes, Cries from the Deep and St. Lawrence: Stairway to the Sea. Musician David Usher released the song "St. Lawrence River" on his Little Songs album in 1998. The novel and film Black Robe is set primarily on the St. Lawrence River during the 17th century. ^ a b c d Benke, Arthur C.; Cushing, Colbert E. (2005). Rivers of North America. Academic Press. pp. 989–990. ISBN 978-0-12-088253-3. Retrieved 21 March 2011. ^ Arkus, Mike (27 October 2014). "Down the St. Lawrence, the World's Largest Estuary: Canadian Odyssey on the Looney Front - Part 21". HuffPost. Retrieved 12 February 2017. ^ Dawson, Samuel Edward (October 2007). The Saint Lawrence: Its Basin and Border-lands. Heritage Books. p. 36. ISBN 978-0-7884-2252-2. Retrieved 21 March 2011. ^ Lac Saint-Pierre et son archipel. Pleinairalacarte.com (2008-11-07). Retrieved 2013-07-12. ^ "Physiographic divisions of the conterminous U.S." U.S. Geological Survey. Retrieved 6 December 2007. ^ "Physiographic Regions of Canada" (PDF). Natural Resources Canada. Natural Resources Canada. Retrieved 18 February 2017. ^ Johnson, William Henry (20 May 2007). French Pathfinders in North America. Retrieved 27 February 2011 – via Project Gutenberg. ^ The Spanish names Florida, Dry Tortugas, Cape Canaveral, Appalachian, and California appeared earlier.....From Spanish historian Antonio de Herrera y Tordesillas's accounts, published in 1601 -- Stewart, George (1945). Names on the Land: A Historical Account of Place-Naming in the United States. New York: Random House. pp. 11–17, 29. ^ "Une baleine noire en vue! Merci d'appeler Urgences Mammifères Marins! - Baleines en direct". ^ "Introduction". Archived from the original on 22 October 2013. Retrieved 5 February 2016. ^ "Hear them coming: right whales return to the Gulf of St. Lawrence". Fisheries and Oceans Canada Homepage. 22 April 2013. Retrieved 5 February 2016. ^ "Une baleine noire dans le Parc marin du Saguenay-Saint-Laurent". ^ "Regional Species Extinctions - Examples of regional species extinctions over the last 1000 years and more" (PDF). 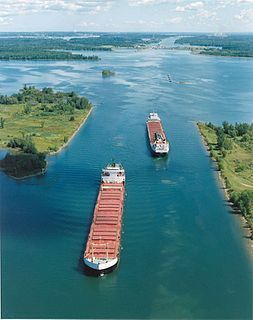 ^ "Saint Lawrence River and Seaway". Encyclopædia Britannica. Retrieved 7 September 2009. ^ "Saint Lawrence". MSN Encarta. Archived from the original on 6 July 2008. Retrieved 7 September 2009. ^ "Little Songs: David Usher: Amazon.ca: Music". www.amazon.ca. Ellis, William S. (May 1980). "Canada's Highway to the Sea". National Geographic. Vol. 157 no. 5. pp. 586–623. ISSN 0027-9358. OCLC 643483454. The Island of Montreal, in southwestern Quebec, Canada, is at the confluence of the Saint Lawrence and Ottawa rivers. It is separated from Île Jésus (Laval) by the Rivière des Prairies. Lake Saint-Louis is a lake in southwestern Quebec, Canada, at the confluence of the Saint Lawrence and Ottawa Rivers. The Saint Lawrence Seaway passes through the lake. Lake Saint Pierre is a lake in Quebec, Canada, a widening of the Saint Lawrence River between Sorel-Tracy and Trois-Rivières. It is located downstream, and northeast, of Montreal; and upstream, and southwest, of Quebec City. The end of the lake delimits the beginning of the estuary of Saint Lawrence. The Mille Îles River is a channel of the Ottawa River in southwestern Quebec, Canada and runs into the Rivière des Prairies. It is 42 kilometres (26 mi) long. Like most major cities, Montreal needs easy highway access from its suburbs and surrounding areas. However, because Montreal was built on an island surrounded by three rivers, it can be entered by land only on a bridge or through a tunnel. Although the city was founded in 1642, it was not until 1847 that the first fixed link to the outside was established when a wooden bridge was built across Rivière des Prairies to Île Jésus, on the site of what is now Ahuntsic Bridge. Another bridge was built immediately afterward, a few kilometers west, which became Lachapelle Bridge, and another in 1849, Pont des Saints-Anges, to the east. The latter bridge collapsed in the 1880s and was never rebuilt. Tadoussac is a village in Quebec, Canada, at the confluence of the Saguenay and Saint Lawrence rivers. The indigenous Innu called the place Totouskak meaning "bosom", probably in reference to the two round and sandy hills located on the west side of the village. According to other interpretations, it could also mean "place of lobsters", or "place where the ice is broken". Although located in Innu territory, the post was also frequented by the Mi'kmaq people in the second half of the 16th century, who called it Gtatosag. Alternate spellings of Tadoussac over the centuries included Tadousac, Tadoussak, and Thadoyzeau (1550). Tadoussac was first visited by Europeans in 1535 and was established in 1599 when the first trading post in Canada was formed there, in addition to a permanent settlement being placed in the same area that the Grand Hotel is located today. The Rivière du Loup is a river in eastern Quebec, Canada, which empties on the south shore of Saint Lawrence River at the city of Rivière-du-Loup, which is part of the regional county municipality (RCM) Rivière-du-Loup, in the administrative region of Bas-Saint-Laurent. Autoroute 20 is a Quebec Autoroute, following the Saint Lawrence River through one of the more densely populated parts of Canada, with its central section forming the main route of the Trans-Canada Highway from the A-25 interchange to the A-85 interchange. At 585 km (363.5 mi), it is the longest Autoroute in Quebec. It is one of two main links between Montreal and Quebec City; the other is the A-40. Route 138 is a major highway in the Canadian province of Quebec, following the entire north shore of the Saint Lawrence River past Montreal to the temporary eastern terminus in Kegashka on the Gulf of Saint Lawrence. The western terminus is in Elgin, at the border with New York State south-west of Montreal. Part of this highway is known as the Chemin du Roy, or King's Highway, which is one of the oldest highways in Canada. Côte-Saint-Paul is a neighbourhood located in the Southwest Borough of Montreal, Quebec, Canada. Île aux Basques is a Canadian island located in the lower estuary of the St. Lawrence River, about 5 kilometres (3.1 mi) north of Trois-Pistoles, in Les Basques Regional County Municipality of the Bas-Saint-Laurent region of Quebec. The island is part of the municipality of Notre-Dame-des-Neiges. SS Brulin was a lake freighter that worked the North American Great Lakes routes from 1924 to 1960. She was renamed Outarde in 1939, and James J. Buckler in 1960, shortly before she ran aground and sank during salvage operations. Brulin was built by Palmers Shipbuilding and Iron Company, Hebburn-on-Tyne and launched on 31 July 1924, for the Montreal Forwarding Company. She was built to the maximum dimensions of the canal locks that preceded the St Lawrence Seaway. The estuary of the Saint Lawrence in Quebec, Canada is the largest estuary in the world.